* Bought for GBP 7.99 at LEGOLand Windsor. Having reviewed just one or two Friends sets in the past, this one happened to appear on my radar when looking for something on LEGO S@H. Immediately I knew I had to have the minidoll for my collection, so as luck would have it I was able to pick one up just last week. Before I continue: go and check out just2good’s video review of this set, which is almost as good as this one’s going to be. He’s as much of a Friends fan as I am, and is a good reporter of the latest information on LEGO sets. Over on this side of the pond, this set only started appearing in LEGO stores in the last couple of weeks or so. This is what to look out for on your next visit: this accessory pack sticks out like a sore thumb among the current wave of Friends sets. You’ll see it’s in the same kind of packaging as the Collectible Minifigure styled accessory packs, and just as pricey too! Here are the entire contents of the set, minus a few key parts, and here’s my analysis. 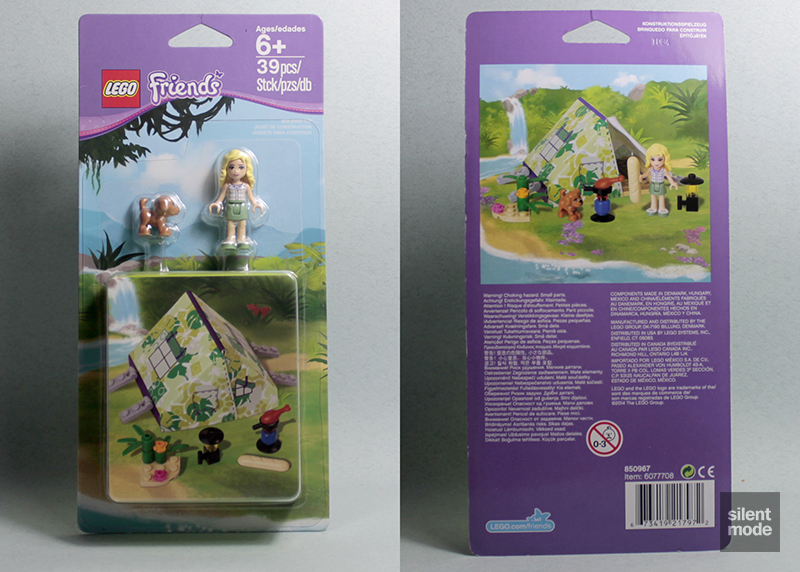 The 3×3 corner plate in Tan appears in a few other sets, but as far as this year goes it’s currently exclusive to the Friends theme, appearing in four other sets: Turtle’s Little Paradise, Stephanie’s New Born Lamb, Jungle Tree Sanctuary and Jungle Rescue Base. The plain Blue minifigure head at the back is a very uncommon part, perhaps even rare, that was previously found in the Hero Factory theme in three sets, and in A LEGO Christmas Tale (or in the Hogwarts Harry Potter set as a different mould). Blue minifigure heads don’t appear every day, so this is going to be the standout part for monofig collectors. The Green 1×1 round brick makes its sixth appearance in a set this year, and I highlight it because it usually comes in such small quantities. The most you’ll find is four in Getaway Glider in The LEGO Movie theme. This set is currently the least expensive source (for this year) for Dark Tan 1×6 tiles: you’ll find five of them in this year’s modular building, Parisian Restaurant. The same is true of the Tan 4×10 and Dark Tan 2×8 plates. Part 11476 (the 1×2 plate with a clip, bottom) is most readily available in this set, although it appears in a handful of others. It could turn out to be a useful part. We’re also lucky enough to obtain a Tan baguette – these were all the rage until the Medium Dark Flesh variant started showing up. If you haven’t pilfered enough of either from Build-A-Mini stations, you’re blessed. The star of the set is this cloth piece that forms the tent. I haven’t seen this kind of thing being used for a very long time in a set (remember, my “dark age” was between 1996 and 2010), and it feels like LEGO are going back to basics. 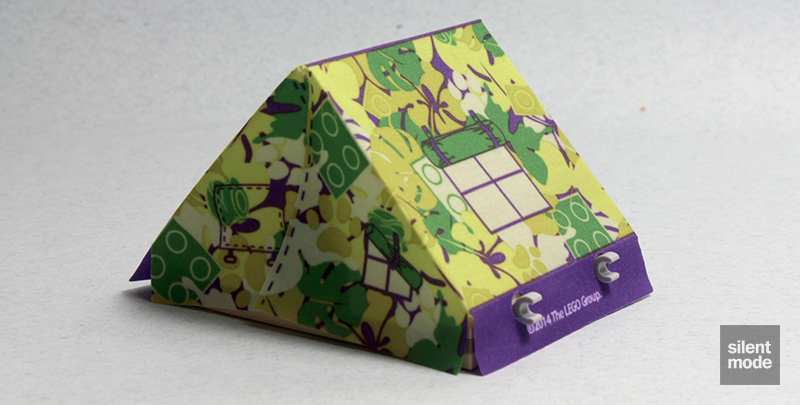 This comes readily folded and crease-free, so that it forms the shape of a tent with “doors” on each side. Well just2good wasn’t kidding: this is the first ever example of an unnamed minidoll. All we know about this one is that she’s female, and comes with Stephanie’s suggestive shirt from Stephanie’s New Born Lamb, and Mia’s skinny legs in a Sand Green skirt from Jungle Tree Sanctuary. Her hairpiece is a Bright Light Yellow variant of Olivia’s hairstyle, shared by Danielle (Downtown Bakery) and Naya (Heartlake Juice Bar), and has Mia’s freckled head. We don’t care about the dog. The set – like the other accessory sets – is full of little builds like this one. The 1×1 brick with vertical bar comes into play to give minidolls (who are unable to rotate their hands) the ability to carry lamps like this one around. It wouldn’t be an outdoors scene without some vague greenery to accompany the set. This construction is just the right height and width for our unnamed minidoll to get behind and – as Bill Cosby once said – do God’s work. The remaining parts are used to form the base of the tent, starting with the two 4×10 plates joined to make an 8×10 base. The Dark Tan tiles and Tan “double bows” form a smooth edge. The tent sits over this base, with the clips from the modified 1×2 plates threading through the holes on each side. Very little effort is required to keep the tent’s shape. Finally the counterpart 1×2 plates act as tent pegs, keeping the cloth part in place. In no time at all you have a small camp site for the unnamed minidoll, or your favourite character from the Friends roster. You can even house a minifigure if you like. There’s nothing to do in the great outdoors except enjoy some freshly cooked chicken/turkey butchered by hand, or a loaf of warm baked bread. With her dog by her side, she doesn’t have a care in the world. There are no leftovers. Every single part you’ve seen above went into the build. The one thing that immediately stopped me buying this set on first sight – apart from its unavailability in the store the first time I went for it – was the price. GBP 10.99 for such a small set (39 parts as it turns out) was out of the question, minidoll or not, and even worse value than the equivalent minifigure sets. However, I was fortunate enough to have been invited to LEGOLand Windsor last week, and found that the same set cost GBP 7.99 in the stores over there, for some odd reason. Obviously that was more like it, but I must rate the set based on RRP. Thankfully it isn’t necessary to buy this set to make the featured minidoll, although it will require the purchase of a handful of more expensive sets (which you may want for the unique minidolls in them anyway). Buying this set just for the minidoll has the added bonus of uncommon parts, such as the Dark Tan tiles and 4×10 Tan plates, and especially the plain Blue minifigure head. The big question you should probably ask yourself is whether you want the tent, which is the main draw of the set. I would say: if you’d like to add one to your collection (and I wouldn’t advise anyone to go out and buy the play mat to accompany this set), by all means pick this one up, preferably at LEGOLand Windsor. If you don’t want the tent, I would recommend trying to find the minidoll or the parts you want on the grey market, or wait for a set discount. As for me, I’m thinking about how to replace the rather neat camouflage pattern on the tent with a “digital” pattern. Bearing in mind the lack of leftover parts and the high price, I’m giving this set 5.2/10. This is one to look out for in sales, or if you can get at least 25% off of the RRP. Who is the unnamed minidoll? You already know who she is.